How will climate warming patterns look in future? Today 11:00am - Regions such as the Arctic and most land areas have warmed more quickly than the global average, while many ocean regions have warmed only a little. Today 11:00am - Dutch engineers are building what will be the world’s largest archipelago of islands made up of sun-tracking solar panels. 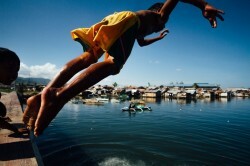 Wednesday - Climate change planning for Pacific Islands cities and towns has been limited, despite their rapid growth.